With summertime coming, and the desire for many to capture photos of family and friends in the swimming pool, on theme park water rides, and water-spraying fun in the backyard, the Galaxy S4 active is the ideal device for your beach memories. In anticipation of what we think will be one of the hottest phones of the year (having the GS4 name), we present the latest rumors on the Galaxy S4 Active and when you can expect to get your hands on a Samsung smartphone that may finally kill the consumer criticism against Samsung smartphones: they’re made of plastic. While the Galaxy S4 lives up to Samsung’s material of choice, plastic, the Galaxy S4 Active may sway former Android users to return to their first love. Let’s go back to this supposed consumer criticism. Samsung has made a name for itself with its Galaxy S handset lineup, but many iPhone lovers have one complaint: Samsung’s phones are made of plastic. A rumor about the soon-to-be Galaxy Note 3 said that Samsung would deviate from the company’s plastic hardware, but this has yet to be confirmed by Samsung. For now, at least, it seems as though the new Note phablet will come with the traditional plastic design, but the Galaxy S4 may stop the criticism. Samsung’s new Galaxy S4 Active will follow the path of Samsung’s XCover and XCover 2 smartphones while rising to popularity amongst the Galaxy S faithful. The model number for the Galaxy S4 Active is GT-I9295, although an AT&T model (number SGH-I537) has been spotted recently. 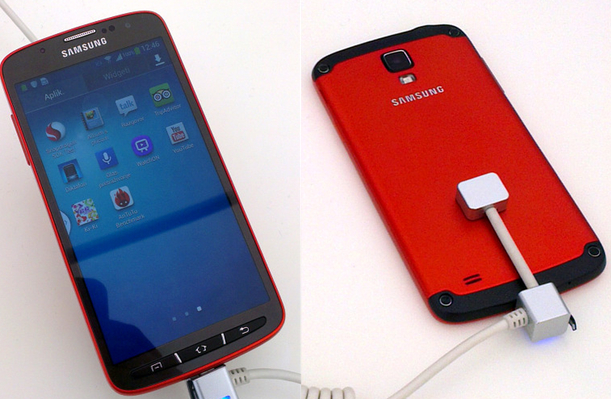 Similar to the Galaxy S4, the Galaxy S4 Active will sport the same five-inch display, 1920 x 1080 screen resolution (full HD), 1080p video recording, and Android 4.2.2. Now, let’s examine the differences between the GS4 and its waterproof brother. The Galaxy S4 Active could use either the GS4’s quad-core, Snapdragon 600 processor or the older Snapdragon S4 Pro processor. AnTuTu benchmarks show that the Galaxy S4 Active is clocked in at the same score as the original GS4 with its Snapdragon 600, so we could be looking at the same processor chip for both handsets. If the Galaxy S4 Active ditches the GS4 Snapdragon 600 processor for the older Snapdragon S4 Pro, there may be a good reason at play: Samsung could use the older processor in order to save a few dollars in manufacturing costs per handset. While the GS4 requires only $237 in manufacturing costs to build, the addition of metal casing on the Galaxy S4 Active will place the manufacturing cost above that of the original GS4. When you factor in the price of the Exynos 5410 processor used in the international GS4 vs. that of the American Snapdragon 600 ($28 vs. $20, respectively), Samsung may revert to an older processor to save money. Samsung’s Galaxy S4 Active casing will come in aluminum metal, matching that of Apple’s iPhone 5, HTC’s “HTC One,” and Nokia’s Lumia 925 as well as three physical buttons on the front (no capacitive touch buttons). According to Sam Mobile, the Galaxy S4 Active will be released in the week of July 15-21, 2013. For photos of the new phone, go here.